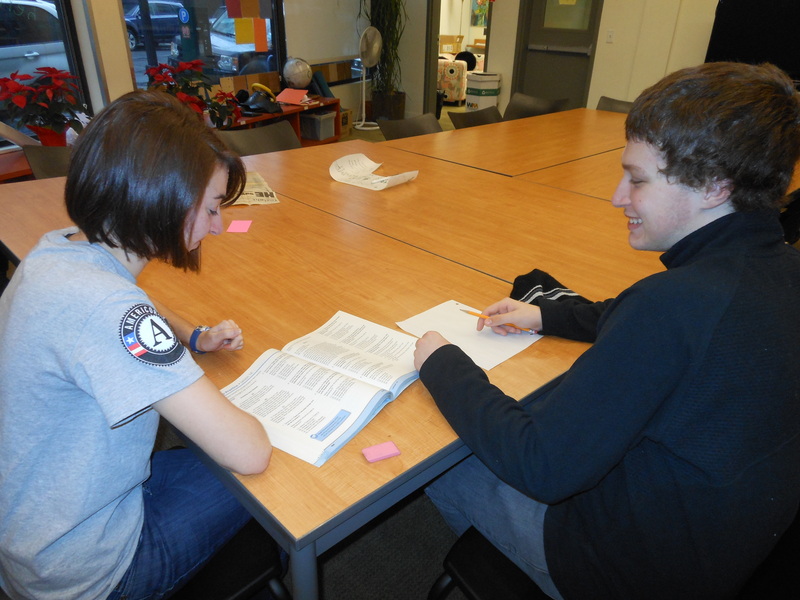 This week, we have a post from Hilary Titus, the Administrative assistant for AmeriCorps for JVC Northwest. In the fall, I had a chance to get out of the office and shadow JV AmeriCorps member Connie Humann at her placement New Avenues for Youth in Portland, OR. New Avenues provides homeless and at-risk youth a range of services aimed to transition youth to permanent housing and future stability. They engage, educate, and empower youth to see the hope and possibilities their lives hold for them. During my visit, I learned how New Avenues serves youth at every stage along the path, from those they describe as street-entrenched, to those enrolled in college courses and transitioning into permanent housing. At every level, New Avenues attempts to engage youth to take each individual step towards realizing their potential and achieving the stability necessary to reach that potential. As the Education Day Services Assistant at New Avenues, Connie primarily serves with the youth during both drop-in hours and tutoring. We spent drop-in hours engaging street-entrenched youth. As Connie gets to know the youth and they seem ready, she points them towards goals in education and job training. Every day, she invites youth to join in the education programming, and when they do come to education hours, Connie serves as a tutor for a wide variety of education needs. That morning we helped a young man make a plan to finish his GED and a young woman study for her math placement exam at Portland Community College. From GED prep, to college homework, and job-related reading and math skills, Connie is there to provide individualized attention and help the youth reach their goals. As a reminder of all that has been accomplished by the youth, the walls of the tutoring room prominently display the names of those who have earned their GED this year, as well as boards charting the progress of youth as they pass tests on their way to earning their GED. Blank sticky notes denote which of the five subject tests each student has passed. One student has proudly written in his high and perfect scores onto his passing sticky notes. As a “behind-the-scenes” player in the mission of JVC Northwest, it was so inspiring to see Connie’s passion and dedication to the progress of the youth she serves. The education team at New Avenues is determined to provide any youth desiring it the space, support, and the tools necessary to make positive steps towards stable and hopeful futures.